Turn heads while you shred! Flip out over the Flipper Guitar Spatula from GAMAGO and cook up culinary masterpieces like a true rockstar. Riff and improv in the kitchen with this essential kitchen tool, whether it be solo or in front of an audience. 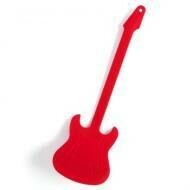 This sturdy spatula is carefully engraved with details of frets and knobs. The spatula is 50% rock, 50% roll, and 100% silicone. Additionally, it’s dishwasher safe and safe for temperatures up to 500 degrees Fahrenheit (280 degrees Celsius). Ideal for both grilling and cooking indoors. Rock on, cooks!